We often think of "life" as a relatively short span of time in between our birth and our death—we celebrate birth as "coming into life" and mourn for the "dead"—when in fact life is an unending continuum, and what we call "birth and death" are merely bodily changes. This is Krishna's beginning instruction in the Bhagavad-gita; for the self there is neither birth nor death. We're all eternal spiritual beings, meant to live eternally in relationship with the Supreme Person. The joy we experience once we understand the difference between our self and our material covering cannot be overestimated. Beyond Birth and Death was prepared from transcripts of lectures Srila Prabhupada gave in 1966 on the second and eighth chapters of the Bhagavad-gita. We cannot calculate the extent of the material universe, but we have Vedic information that there are millions of universes within the entire creation, and beyond these material universes there is another sky, which is spiritual. There all the planets are eternal, and the lives of all the beings on them are eternal. In this verse the word bhavah means “nature,” and here another nature is indicated. In this world we have experience also of two natures. The living entity is spirit, and as long as he is within matter, matter is moving, and as soon as the living entity, the spiritual spark, is out of the body, the body is immovable. The spiritual nature is called Krishna's superior nature, and the material is called the inferior. Beyond this material nature there is a superior nature, which is totally spiritual. It is not possible to understand this by experimental knowledge. We can see millions and millions of stars through a telescope, but we cannot approach them. We have to understand our incapabilities. If we cannot understand the material universe by experimental knowledge, what is the possibility of understanding God and His kingdom? It is not possible experimentally. We have to understand by hearing Bhagavad-gita. We cannot understand who our father is by experimental knowledge; we have to hear the word of our mother and believe her. If we do not believe her, there is no way of knowing. Similarly, if we just stick to the Krishna conscious method, all information about Krishna and His kingdom will be revealed. Paras tu bhavah means “superior nature,” and vyaktah refers to what we see manifested. We can see that the material universe is manifested through the earth, sun, stars, and planets. And beyond this universe is another nature, an eternal nature. Avyaktat sanatanah. This material nature has a beginning and an end, but that spiritual nature is sanatanah—eternal. It has neither beginning nor end. How is this possible? A cloud may pass over the sky, and it may appear to cover a great distance, but actually it is only a small speck covering an insignificant part of the whole sky. Because we are so small, if only a few hundred miles is covered by cloud, it appears that the whole sky is covered. Similarly, this whole material universe is like a small, insignificant cloud in the vast spiritual sky. It is encased by the mahat-tattva, matter. As a cloud has a beginning and an end, this material nature also has a beginning and an end. When the clouds disappear and the sky clears, we see everything as it is. Similarly, the body is like a cloud passing over the spirit soul. It stays for some time, gives some by-products, dwindles, and then vanishes. Any kind of material phenomenon that we observe is subject to these six transformations of material nature—it comes into being, grows, stays for a while, produces some by-products, dwindles, and then vanishes. Krishna indicates that beyond this changing, cloudlike nature there is a spiritual nature, which is eternal. In addition, when this material nature is annihilated, that avyaktat sanatanah will remain. In Vedic literatures there is a good deal of information about the material and spiritual skies. In the Second Canto of Srimad-Bhagavatam there are descriptions of the spiritual sky and of its inhabitants. There is even information given that there are spiritual airplanes in the spiritual sky and that the liberated entities there travel about on these planes like lightning. Everything that we find here can also be found there in reality. Here in the material sky everything is an imitation, or shadow, of that which exists in the spiritual sky. As in a cinema we simply see a show or facsimile of the real thing, in Srimad-Bhagavatam it is said that this material world is but a combination of matter modeled after the reality, just as a mannequin of a girl in a store window is modeled after a girl. Every sane man knows that the mannequin is an imitation. Sridhara Svami says that because the spiritual world is real, this material world, which is an imitation, appears to be real. We must understand the meaning of reality—reality means existence which cannot be vanquished; reality means eternity. The very first step in self-realization is realizing one’s identity as separate from the body. “I am not this body but am spirit soul” is an essential realization for anyone who wants to transcend death and enter into the spiritual world beyond. It is not simply a matter of saying “I am not this body,” but of actually realizing it. This is not as simple as it may seem at first. Although we are not these bodies but are pure consciousness, somehow or other we have become encased within the bodily dress. If we actually want the happiness and independence that transcend death, we have to establish ourselves and remain in our constitutional position as pure consciousness. The impersonalist followers of Shankaracharya, as well as the Vaishnavas following in the disciplic succession from Lord Sri Krishna, acknowledge the factual existence of the soul, but the Buddhist philosophers do not. The Buddhists contend that at a certain stage the combination of matter produces consciousness, but this argument is refuted by the fact that although we may have all the constituents of matter at our disposal, we cannot produce consciousness from them. All the material elements may be present in a dead man, but we cannot revive that man to consciousness. This body is not like a machine. When a part of a machine breaks down, it can be replaced, and the machine will work again, but when the body breaks down and consciousness leaves the body, there is no possibility of our replacing the broken part and rejuvenating the consciousness. The soul is different from the body, and as long as the soul is there, the body is animate. But there is no possibility of making the body animate in the absence of the soul. In Bhagavad-gita Sri Krishna points out that all of our miseries are due to false identification with the body. In the summertime we may feel pleasure from contact with water, but in the winter we may shun that very water because it is too cold. In either case, the water is the same, but we perceive it as pleasant or painful due to its contact with the body. All feelings of distress and happiness are due to the body. Under certain conditions the body and mind feel happiness and distress. Factually we are hankering after happiness, for the soul’s constitutional position is that of happiness. The soul is part and parcel of the Supreme Being, who is sac-cid-ananda-vigrahah [Bs. 5.1]—the embodiment of knowledge, bliss, and eternity. Indeed, the very name Krishna, which is nonsectarian, means “the greatest pleasure.” Krish means “greatest,” and na means “pleasure.” Krishna is the epitome of pleasure, and being part and parcel of Him, we hanker for pleasure. A drop of ocean water has all the properties of the ocean itself, and we, although minute particles of the Supreme Whole, have the same energetic properties as the Supreme. The atomic soul, although so small, is moving the entire body to act in so many wonderful ways. In the world we see so many cities, highways, bridges, great buildings, monuments, and great civilizations, but who has done all this? It is all done by the minute spirit spark within the body. If such wonderful things can be performed by the minute spirit spark, we cannot begin to imagine what can be accomplished by the Supreme Spirit Whole. The natural hankering of the minute spirit spark is for the qualities of the whole—knowledge, bliss, and eternality—but these hankerings are being frustrated due to the material body. The information on how to attain the soul’s desire is given in Bhagavad-gita. Is there life after death? Srila Prabhupada tells how the soul travels from body to body, and how we can end the cycle of birth and death by reaching the ultimate abode. India's most renowned Vedic authority presents startling evidence of the soul's incredible journey after death. 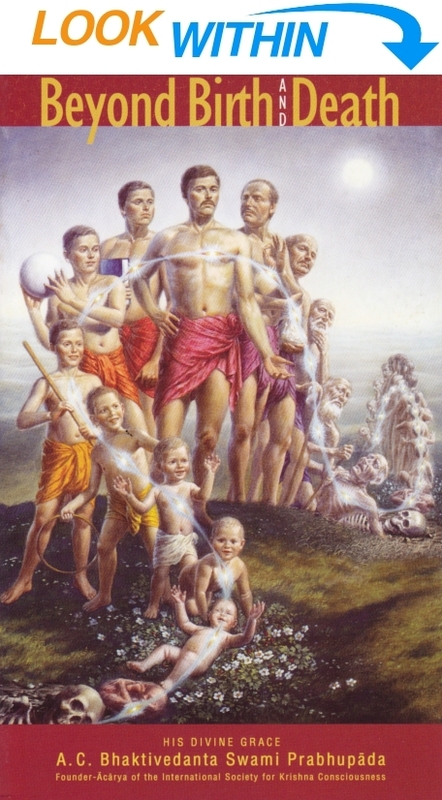 Beyond Birth and Death was prepared from transcripts of lectures Srila Prabhupada gave in 1966 on the second and eighth chapters of the Bhagavad-gita. The editor was Srila Prabhupada's disciple Hayagriva Dasa (Howard Wheeler, M.A. ).